The final featured deck of the Thoughtseizes and Fatal Pushes series represents a change of pace. While it’s still a midrange creature deck at heart, the philosophy and strategy behind it are quite different from the Death’s Shadow and G/B/x decks of previous weeks. Understanding the variety of strategies available in Modern is an important part of mastering the format, no matter what deck you might choose to play for yourself. So since W/B Eldrazi was one of the most-requested decks in the comments of my previous articles, I decided it would be the perfect capstone to the series. W/B Eldrazi, sometimes called Eldrazi and Taxes, is what’s called a Hatebears deck. The idea behind Hatebears is that sacrifices in speed and power can be worthwhile if you can gain the ability to slow down and unbalance the opponent in return. After all, what matters in MTG is not how powerful your plays are, it’s how much more powerful your plays are than your opponent’s. If you can sufficiently hinder the other player’s ability to cast spells, then it doesn’t much matter what you use to kill them. A good way to understand Hatebears is by comparing these two cards. Tarmogoyf has been a hallmark card of many of the decks featured in this series so far. It’s a straightforward card, and its value is easy to understand—you put a huge amount of power and toughness onto the battlefield in exchange for a small amount of mana. Thalia, Guardian of Thraben has the same converted mana cost, but is only a 2/1 creature. You give up power and toughness, but instead you slow down (sometimes shut down) players’ ability to cast spells. If you could only cast one creature, you’d probably prefer that it be Tarmogoyf. 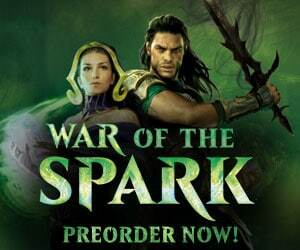 ‘Goyf can win the game in four or five attacks while Thalia would take ten. At face value, Tarmogoyf looks much better. But consider which one looks better when the opponent has Supreme Verdict? Now Thalia (and the rest of your creatures) will get one additional attack before dying. Now what if your opponent misses their fifth land drop and can’t cast the Supreme Verdict at all? Games of Modern often hinge on the timing or castability of a single spell, and the presence of a Thalia can sometimes change the course of the game in your favor. Tarmogoyf is great as a single threat on turn 2, but a second copy of Tarmogoyf begins to lose some value. The first ‘Goyf will unload 20 damage by about turn 7, but casting a second Tarmogoyf probably only speeds up your clock by about a turn while leaving you more vulnerable to certain anti-creature cards. Thalia is less impressive as a single threat on turn 2, but begins to look great when your turn 3 is Leonin Arbiter-plus-Ghost Quarter. The disruptive qualities of the Hatebears deck work well together and all contribute to tightening the squeeze on the opponent. Thalia, Leonin Arbiter, and the hateful sideboard cards all create symmetric effects that oppress both players. But you’ll quickly notice that W/B Eldrazi is minimally affected by these cards relative to other decks in Modern, which might fold completely. What I like about this deck in particular is that it balances the disruptive elements of the Hatebears strategy with the raw power of the Eldrazi tribe. All of the creatures are chosen to unbalance and pester the opponent in some way. But in those games where you’re unable to stop the opponent from finding their footing, you can still hope to bash their brains in with an accelerated Thought-Knot Seer. The mana base is a work of art, with Ghost Quarter and Caves of Koilos rounding out the number of colorless sources for the Eldrazi, and with Aether Vial giving you extra ways to cast both your colored and colorless creatures. The mana requirements are relatively modest, but Ghost Quarter and Shambling Vent provide insurance against flooding. Eldrazi Displacer is a perfect end-game plan. You want a high concentration of disruptive creatures, which leaves you minimal space for removal and other ways to force past blockers. So when your opponent does present that giant Tarmogoyf, the plan becomes to slow the game down until you can dominate the battlefield with Eldrazi Displacer. In addition to the difference in strategy, W/B Eldrazi was a little bit of a stretch to fit into this series due to its individual card choices. All of the previous decks played Fatal Push and Thoughtseize in the main deck—often in 4 copies. This is not the case with W/B Eldrazi. Thoughtseize is a fringe option that some players don’t include at all. I found that a few copies (main deck or sideboard are both fine), fit the mana curve well and round out your disruption against combo and control decks. Path to Exile is better than Fatal Push in the main deck for a few reasons. Leonin Arbiter is an obvious one, but an absence of fetchlands also makes revolt more difficult to trigger on Fatal Push. Finally, when you can only afford a small amount of removal, you really want it to take care of the problematic creature each and every time. That said, Fatal Push remains an excellent sideboard option against decks like Burn and Affinity. I was skeptical of this deck when I first started playing it. I thought that cards would be underpowered, and that I would be working harder than I needed to in order to earn my wins. I ended up being pleasantly surprised. While I won’t claim that W/B Eldrazi is the best deck in Modern, I’m now confident that it’s at least a competitive strategy. I won’t be surprised to see it at the top of the standings in upcoming Modern events. There were a few aspects of W/B Eldrazi that I liked quite a lot. While some of the cards are individually low on power level, it still has the potential for nut-draws through Aether Vial or Eldrazi Temple. I was very impressed by Tidehollow Sculler, which is a strong card that’s made even stronger by the W/B Eldrazi deck. The mana denial elements and other must-kill creatures make it more likely that the Sculler will survive, and the ability to process the card with Wasteland Strangler sometimes means that the opponent only has a very narrow window to kill it at all. Blinking Scullers and Thought-Knot Seers with Eldrazi Displacer in the late game can allow you to do a Lantern Control impression and lock your opponent out of the game. This deck is legitimately excellent against any opponent who requires a lot of set-up in order to function. This includes combo decks, mana hungry decks, and decks that spend their early turns on Thought Scour and Serum Visions—decks that Thalia punishes severely. W/B Eldrazi tends to improve in every matchup after sideboarding. This is common quality in black midrange decks as they’re difficult to attack and can tailor their answer cards after sideboarding, but it’s even more extreme in the case of W/B Eldrazi. White offers the most potent sideboard cards in Modern, and W/B Eldrazi is one of the very few decks that can take full advantage of Rest in Peace. In the last installment, I said it was the wrong time for Jund. Small creature decks aren’t at the forefront right now, and there are a lot of matchups where having too much removal is a liability. For exactly the same reasons, I think it’s the right time for W/B Eldrazi. A black midrange strategy with high threat density and built-in disruption and resilience is exactly what I want to be playing right now, and W/B Eldrazi fits the bill. I still don’t rate it quite as highly as Abzan or Traverse Shadow, but if this is a strategy that appeals to your play style, I highly recommend giving it a try. W/B Eldrazi will be the last deck that I’ll be devoting an article to. But keep a look out for one last article to wrap-up the series, with a look back at the strengths and weaknesses of the various decks I’ve covered.